Quench your thirst for nature and style by adding a water feature to your lawn or garden. From fountains and waterfalls to ponds and birdbaths, water features offer a unique, natural enhancement that blends seamlessly with the Alaska landscape and invites the great outdoors into your own backyard. "They wash away the noise of the outside world, dance with the sunshine, and bring in wildlife," muses Jon Cobb, from Green Acres Landscaping. The benefits of a water feature don't end with aesthetics. "It adds value and curb appeal to your home. It's another element of nature to balance out your yard, and it can also camouflage an eyesore," adds Anvy Faltz, from Faltz Landscaping. And contrary to popular belief, water features don't have to be elaborate or expensive to achieve the desired effect. Pondless garden fountains or waterfalls top the list of easiest to install and maintain, and are a good alternative to the traditional birdbath. Still water requires more maintenance than most people are willing to supply. "Without aggressive weekly cleaning they can become breeding areas for mosquitoes and vectors for disease for the birds that you are trying to attract," explains Cobb. "The constant flow and filtering of water in a fountain will avoid this." They also offer a wide range of choices in texture and color, from natural stone with a drilled core to manufactured vase or statue shaped fountains. Aside from regular cleaning, they require little upkeep, says Cobb. "In these systems the water reservoir is under a rock and gravel bed. This gives the water limited exposure to sunlight that causes algae growth," explains Cobb. "This also helps to filter the water before it even reaches the pump, thus reducing the chance for the pump filters to clog and require cleaning." 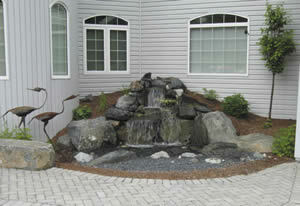 The installation of fountains or waterfalls is also something that a motivated homeowner can accomplish. A pre-drilled natural rock or pre-made stone fountain only requires a pond liner, gravel and a small pump in order to operate. But do your homework first by consulting an expert. 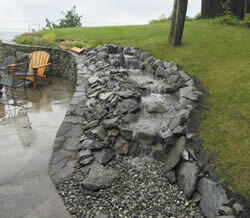 Some natural rock fountains can weigh many hundreds of pounds and require serious equipment to place. Several experts offer guidance on the placement of your water feature, which can make or break the tranquility of your yard. Cobb recommends considering areas that offer viewing opportunities. "It is nice to have a water feature near a patio, deck, or other places where you will be spending time," he notes. Homeowners should also be mindful of the wind factor in their area. "This can affect how the water will flow or splash, so you may have to adjust the design to compensate so you won't lose water in your fountain/waterfall area," explains James Faltz, from Faltz Landscaping. Caring for water features is relatively simple. To "hibernate" most water features during the winter, most require only that you remove the pump before temperatures reach freezing. Other features may have water basins, which you will need to either drain and cover or bring them indoors. Various additives can be incorporated to the water feature as an organic method of repelling insects. However, the mere movement and flow of the water feature acts as a natural insect repellent. "Mosquitoes will not breed in moving water. The circulating system in pondless waterfalls and fountains takes care of any problems you might have with unwanted insects," explains Cobb. Another potential issue is algae buildup. Several products are available on the market for stemming algae growth. Water features are also introducing other eco-friendly options to homeowners. 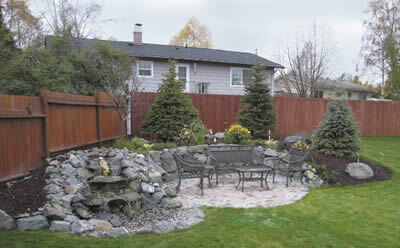 Green Acres Landscaping, for example, is currently working with the Anchorage Municipal Rain Gardens program to incorporate pondless waterfalls into the Rain Garden design. "Surface water runoff from impervious surfaces like roofs and lawns can be directed to a collection reservoir that is used for the waterfall," explains Cobb. "Rain gardens act as buffers by filtering storm water runoff and improving water quality before it reaches storm drains that eventually flow into streams, rivers and lakes." From waterfalls to fountains, a water feature can be high on style and low on maintenance. Even better, you can create a serene sanctuary right outside your door.